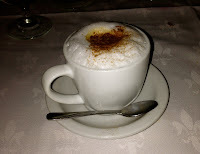 Last night we finally went to La Nonna Bella, a cozy, authentic Italian restaurant on Franklin Avenue in Garden City, just down the street from where we live. As we were walking in to the back entrance to the restaurant, we could hear the chefs in the kitchen shouting at each other in Italian ... that's when we knew we were in for a great meal! It was a Friday evening at 7:30, and the place was hopping. Nearly every table was full and so was the bar, which was very lively and inviting, and the bartenders attentive and friendly. 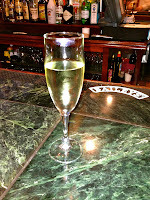 They have an excellent selection of Italian and American wines, albeit with pretty steep prices. 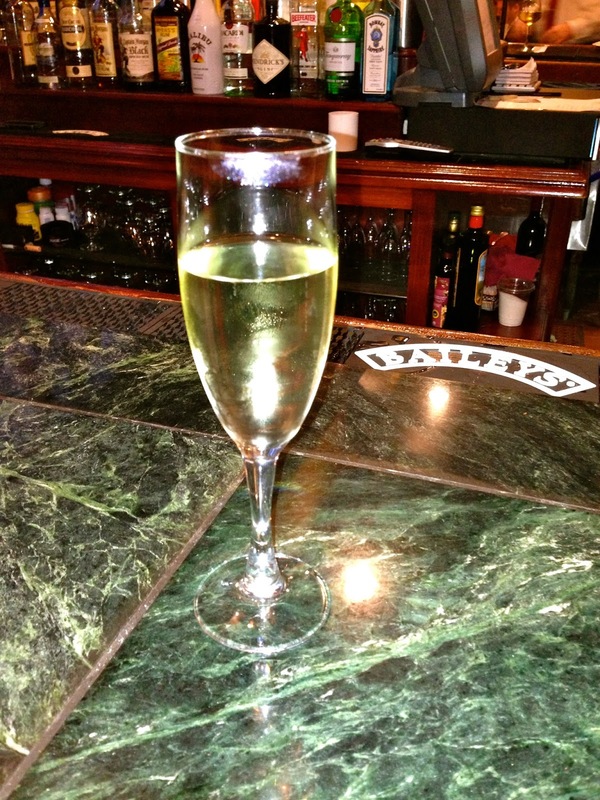 I started with a glass of Prosecco, my latest obsession, and it was perfectly dry and bubbly. 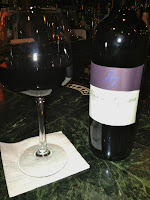 My friend, having just returned from a trip to Italy, had a glass of the Super Tuscan and loved it. 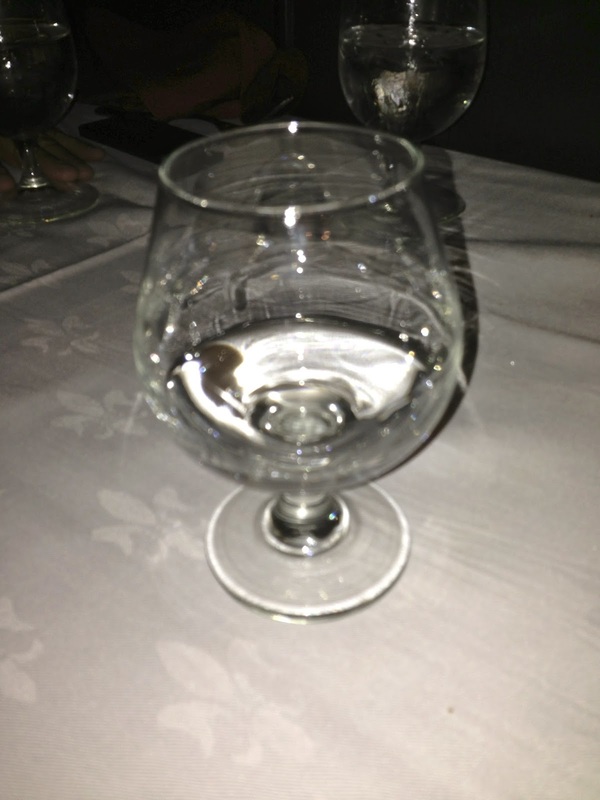 Although they had a table waiting for us since we had a reservation, it was near the bar and very loud. We asked if there were any tables available upstairs, and they were more than happy to accommodate us. That was a very nice touch. After enjoying our drinks at the bar, we went upstairs to sit down for dinner. The upstairs is actually a loft overlooking the dining room - it's quieter but you still feel like you're "part of the action." 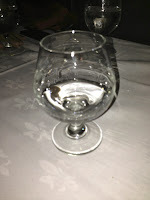 The waiter was very friendly and knowledgeable about the menu. He rattled off four or five specials without missing a beat, and answered any questions we had. The Bread Basket: Yes, I judge restaurants based on their bread basket! At La Nonna Bella, they bring an assortment of mini tomato focaccia and plain rustic Italian bread. The focaccia was delicious, and some pieces were even in the shape of a tart, which was really cute, however they were cold. It would have tasted so much better had they been brought to the table warm. The Italian bread was a little too hard, as if it was not fresh. I grabbed an end piece, the "panuche" as my Italian grandmother would say, and I couldn't even bite it or break it apart with my fingers! That was pretty disappointing. 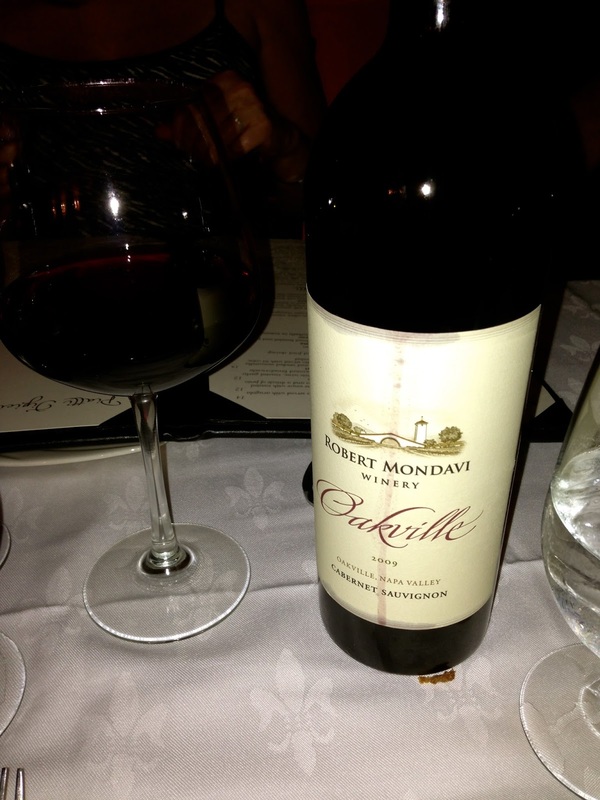 We started out with a bottle of the 2009 Robert Mondavi "Oakville" Cabernet Sauvignon, which was excellent! A perfect, full-bodied cabernet. For appetizers, we ordered the Antipasto Della Casa and the Delizia Di Gamberi (translation: delight of shrimp - and it was!). We all agreed the shrimp appetizer was the winner. Three large shrimp were wrapped in smoked mozzarella and prosciutto, and pan seared so the outside was super crispy when you bit into the shrimp. The shrimp were served with a very fresh radicchio and arugula salad with sliced fennel and orange segments. We had to resist the urge to order a second serving! Delizia Di Gamberi appetizer - a must try! The antipasto appetizer was very good - fresh mozzarella and tomato, prosciutto, salami (I think it was wine-cured), good parmigiano reggiano, a soft brie-like cheese, marinated artichoke hearts and roasted red peppers, and assorted olives. I just wish the bread was a little better to go with this delicious appetizer! Pesto Pappardelle with Lobster and Shrimp: This was one of the specials for the evening and I couldn't resist ordering it. I am a huge fan of homemade, fresh pasta and I love pappardelle - those wide, flat ribbons of bliss...so I was a little disappointed when I first bit into it and realized they had taken "al dente" to a whole other level! The pasta was just too underdone for me. To the contrary, the shrimp were overcooked. However, the lobster meat was delicious and succulent, and the pesto sauce was excellent. I wasn't a huge fan of the giant fava beans in the dish. I was really looking forward to this dish, but could not get over the undercooked pasta and overcooked shrimp. Veal sauteed with wild mixed mushrooms and marsala wine. My husband is a big veal marsala fan (we even served it at our wedding!) so for him to say this was a great dish is a huge compliment to the chef. I loved it as well - the veal was tender, the mushrooms were fresh and earthy, and the sauce was rich and sweet, like a good marsala should taste. We would definitely order this again. Chicken Saltimbocca: This is actually a veal dish on the menu, but my friend asked if they would do it with chicken instead, and they happily obliged. 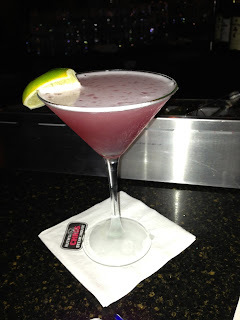 It looked really good, but the minute I heard my friend ask the waiter for a "sharper knife," I knew there was a problem! The chicken was a little overcooked, so not as tender as it should have been. The salty zing of the mozzarella and prosciutto was nice, but the overcooked chicken could not be overlooked. And on to dessert...we were having such a nice time drinking wine and chatting that when the waiter brought the dessert menus (without asking - so persuasive! ), we said "why not?" and began perusing the menu. Literally, everything on the dessert menu sounded wonderful, it was so hard to choose! We settled on the Apple Strudel, the Chocolatissimo (flourless chocolate cake), and the Tiramisu. 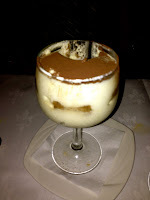 The Tiramisu was quite possibly the best I've ever had - it was my favorite type - served in a dish, not in a cake form, and so light and creamy with the perfect amount of espresso flavor. 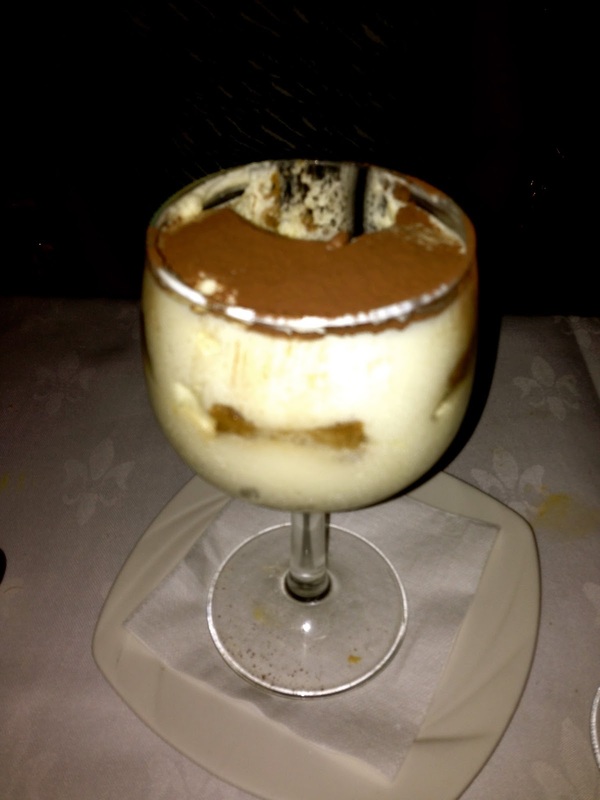 I will definitely order the tiramisu next time! The flourless chocolate cake was so rich and chocalatey - I know why they named it "Chocolatissimo"! This is a must have. The apple strudel, served with cinnamon gelato, was also very good. We were very happy with the desserts overall! 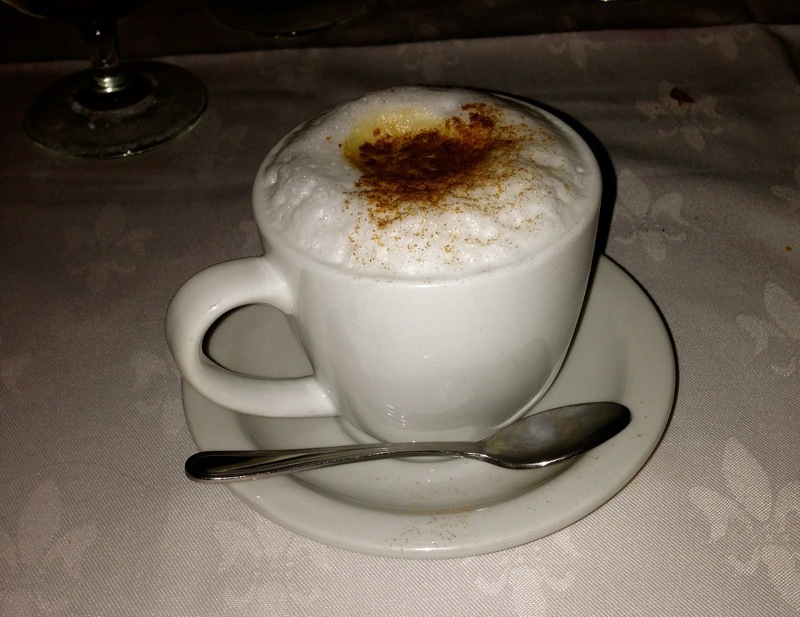 Overall, we had a great experience at La Nonna Bella. I was a little disappointed with some of the missteps in preparation, such as overcooking and undercooking some items, but I will return to try other dishes. The service and atmosphere was very good, as was the wine selection and dessert menu.